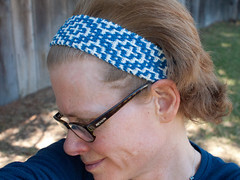 Mosaic Headband Pattern was posted on June 14th, 2011 at 11.04am and is filed under Blog, Free Patterns, Handmade. This entry has 2 comments. You can follow any responses through the RSS 2.0 Feed. 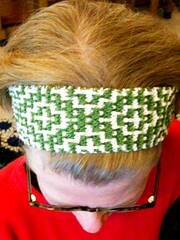 I’ve always been intimidated by mosaic knitting. The descriptions are always so wordy and I couldn’t quite believe that it would work. But when I decided to be brave and try it out on this little project, I discovered how fun and easy it is! To sum up: you follow a chart of dark and light squares. 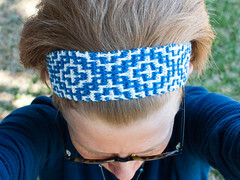 You knit across and back with only one color of yarn, then drop that color and knit back and forth with the other color. While knitting with color A, you slip any stitches which are color B on the chart. Both directions. That’s it, that’s all there is to it. Just try it! That looks great. I’ve never tried mosaic knitting, and the Barbara Walker photos just don’t do the technique justice. Hi kara – Just stopping by to thank you for your Librivox recordings. Pride and Prejudice has sustained me over many a long car journey, and your readings are very listenable and among my favourites. Thanks for putting in your time to create them.